We all know Daan Jippes, the great artist behind dozens of great adventures, his unique style, his unique characters. Well, I'm now proud to introduce to you my own interview with this great man, which has been previously published on Rappet #21. My first "encounter" with the Disney universe was an animated cartoon. "Polar Trappers"; in my local cinema, at age four. I hated Donald in there who was so mean at that little penguin! I shed tears actually, illustrative of the effectiveness of Disney`s work. A year later I became mesmerized by the appearance of the belgian Mickey Magazine weekly, which featured all the regular comicbook material but also the more mature King Features strips! 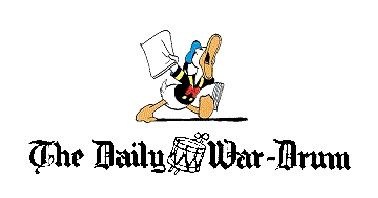 Another year later Donald Duck weekly was launched in the Netherlands and I became a subscriber from the second issue on. From that time on I started to copy anything to my particular liking from those pages. The selection I made of what was "worthy"of copying must`ve said something about my developing personality. Are you an autodidact? By which great past artists are you inspired the most? Yes, I "taught" myself to draw. Primarily and not unimportantly: also taught myself to observe. And to act out.. And to shape and design. And to judge..
All that comes into play when doing a comicstrip. Of course a few favourite artists influenced my taste greatly. The "flair" in their work was decisive I believe. Carl Barks and the earlier André Franquin (= pre-Gaston) played their major parts..; but also Raymond Macherot, Tibet, Floyd Gottfredson, Paul Murry, etc.. Morris ( Lucky Luke) .. oh.., too many to mention really! You drew all Carl Barks' scripts after his retirement including 24 Junior Woodchucks stories. Among these there is Life Savers, which stands out because the original Carl Barks' script appears to be lost. Is this the case, or did you have Barks' original layout script to draw it? There were a few Woodchucks`-scribbled scripts missing, that`s true. But these have surfaced since the time all the others were published in the Another Rainbow Carl Barks Library in the later 1980`s. And later still "King Scrooge the First". Since its creation having been in the possession of Del Connell who worked as art director at Western Publishing in Burbank in the 1970`s. In 2007, your version of Barks' The Pied Piper of Duckburg has been published . Barks only left the first three pages of it, how did you reconstruct the missing ones? What do you think about Rosa's version? As far as I remember there was NO clue to be found in those first three pages to build on for the rest of a potential "story". Apart from that "bridge over the Duckburg River" being mentioned, and to be spotted in panel 4, page 2, THAT I used as a key location for the business in the chain of events that MIGHT, eventually, encompass a "story"... ( a story with a splash ending, preferably, involving armies of rats, to be sure!). I aimed for a plot that would accommodate lots of action.. Duck-plots SHOULD do so (I truly believe and have always done so) with fun-to-visualize physical stuff. After all, I consider the comicstrips still to be a by-product of the cartoons of yore. (well, that`s how I was raised!). And that`s where I differ from artists and writers like Don Rosa. His plot here, and the way he fleshed it out, is an example of his brand of "indoor-dialogy" continuity. What do you think about the Lo$ (The Life and Times of $crooge McDuck)? His "Life and Times of Scrooge Mc Duck"-saga is a bold endeavour to "complement" and fill in the blanks and gaps in Barks` Scrooge-oeuvre. Grounded in a "concept" which suggests Barks`stories about the old miser are all logically and chronologically consistent. Well, I really believe they were never MEANT to be that! So.. if I have a critique there, that`s where it`s to be found. What is, in your opinion the role of comics? Comics have no "role". Their role is that they ARE. Are there to entertain. Most fail to do so, or do it only adequately. And that`s just fine. How do you see the comic books situation in Europe? The comicbook "situation"-you speak of- in Europe is that the "situation" is gasping for air. Anything goes in a situation like that. Anything is tried; anything is put to the test. "Let`s see what sticks to the wall after it`s been thrown against it. ", seems to be the publishers`mantra. A sign of a certain desperation. A commercial one in the first place. And without a commercial basis the desperation`s bound to persist. Until the whole business perishes. I write and draw with continued pleasure under the expert guidance of editor Byron Erickson.. When I`m not supplied with scripts by John Lustig from the office, that is. What could you tell us about your “Havank”? On HAVANK: after two album-adventures that project`s dead in the water. Though I`ve finished writing a third story I lack the time and funding to start drawing and coloring those 44-plus pages. And here there is the majestic Gedeone de' Paperoni drawn by Jippes for the Danish fanzine. Excellent job, Sim! It's good to know Daan is still at it and his work is as vibrant and thought-out as ever. Thanks too, for posting his pure ink drawing of Gedeone... that singular drawing can teach plenty about attractive design, construction, perspective and placement of line weight. It may seem like he drafts it quickly/deftly, but that level of craftsmanship takes many, many years of drawing and observation to achieve. Daan's comments above on his influences and selective tastes reflect that.